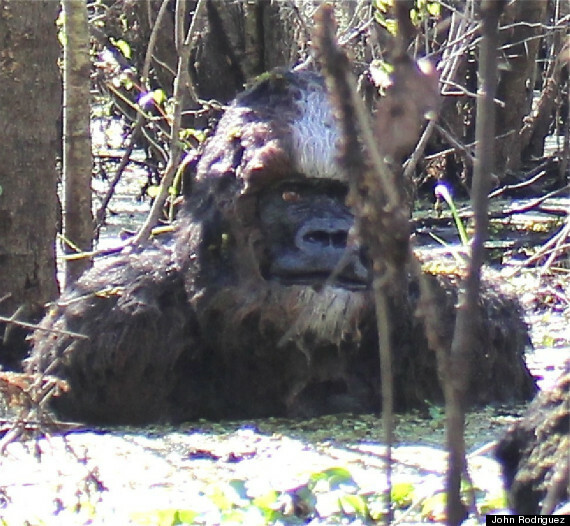 An article written by Lee Speigel and published in the Huffington Post in January of 2015 contained an image that purported to show a skunk ape partially submerged in a Florida swamp. The photo was submitted by John Rodriguez, a 66-year-old retired electrician, who claimed to have stumbled across the creature while fishing on the Hillsborough River near northeast Tampa. The uncanny clarity of the image and the strangely jagged line where the beast meets the water drew instant suspicion, and it was suspected that the picture had been digitally manipulated. Ben Hansen, lead investigator of the Syfy Channel’s “Fact or Faked: Paranormal Files” series, had this to say. Rodriguez, of course, insisted that the photograph was genuine. Rodriguez continued to say that this "debunking attitude" almost caused him to not come forward at all. There's serious room for doubt in that statement, since it seems unlikely that any photo so painstakingly altered wouldn't be released by those who took the time to make it. 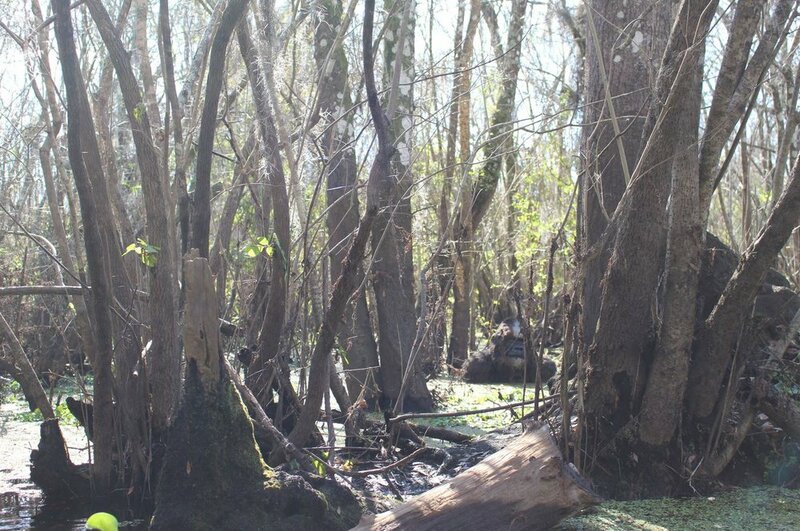 The photograph may have been fabricated by three men that the Florida chapter of the Bigfoot Field Researchers Organization (BRFO) suspect hoaxed the Lettuce Lake skunk ape video released around the same time. According to the BFRO, Matt McKamey, Justin Alan Arnold, and Andy Stern are friends and bandmates who conspired to create a handful of skunk ape hoaxes in early 2015. These hoaxes were likely done to take advantage of the media exposure created by the television show Finding Bigfoot, which was filming in the area at the time. A painting of a skunk ape by Justin Arnold that the website Bigfoot Evidence published in an article about the Hillsborough River photo. The painting bears a strong resemblance to the creature in the photograph. Arnold responded to the allegations of hoaxing with a vehement denial. “I wanted to comment on the false allegations published about me by the BFRO," Arnold said in a response to Bigfoot Evidence. Cryptozoologists were left unconvinced by Arnold's defense, noting that in his rebuttal he admitted to having all of the necessary skills to perpetrate exactly what he was being accused of, and that no other credible reports of skunk apes depict the creature as gorilla-like, nor have any other witnesses come forward to claim the creature has a stripe similar to an actual skunk. Furthermore, the BFRO published copies of written correspondence with Matt McKamey, which disproved Arnold's claim that no one involved was contacted. Justin Arnold has since removed himself and his art from the web, and his social media accounts that were once used to promote his artistic pursuits appear to have been deleted. Whatever the case, he and his friends seem to have gone to ground. And as for John Rodriguez, he may have never existed at all, since he has never been identified beyond his initial email correspondence with the Huffington Post. Perhaps, much like the "skunk ape" in the photo, they felt themselves sinking into a quagmire, and decided that it might be best to make their escape before becoming submerged completely.